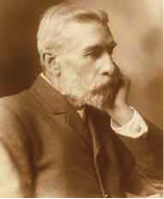 Ernest Favenc was an English-born Australian poet and also the author of a number of books covering a wide range of subjects, from children’s stories to exploration. He was often commissioned by both the government and the proprietors of the Queenslander newspaper to carry out surveys in different parts of the continent, these journeys usually taking several months to complete. He would then prepare a detailed report and, on his return, present it for scrutiny. Typical projects included investigations into the economic and social feasibility of connecting regions with new or existing railway lines. He was born in the south eastern town of Walworth, in Surrey, the son of a successful merchant. He was able to trace his family tree all the way back to the Huguenots. Little is known of his childhood but he was sent to school in Germany, to the Werderscher Gymnasium in Berlin. He then returned to England to study at the Temple College in Cowley, Oxfordshire. Soon afterwards he emigrated, arriving in New South Wales sometime during 1864. He remained there for about a year before taking up employment in the pastoral industry, where he found himself in the frontier squatting districts of Queensland. Besides working out of a number of stations in North Queensland, over a period of 14 years, he also wrote regularly for the Queenslander. His great exploration adventures began in 1878 when, accompanied by four other men, including one Aboriginal, he conducted a six month study of the area covering the far-northern town of Darwin and the western border of Queensland. The question that he had to answer concerned the connection of the existing Queensland Railway system to Port Darwin. His deliberations eventually came down on the side of positivity and a line to Darwin would, indeed, be feasible. His useful knowledge of bush craft helped enormously and the report that he produced was well received. He followed this up with a number of other explorations, covering areas such as the north western part of Western Australia and south of the Gulf of Carpentaria. Some of Favenc’s verse and short stories appeared under the pseudonym Dramingo and were published in the Queenslander. Some of his pencil sketches also appeared in there, to illustrate his work. Ernest Favenc died on the 14th November 1908 at his home in Darlinghurst, Sydney. He was 63 years old.